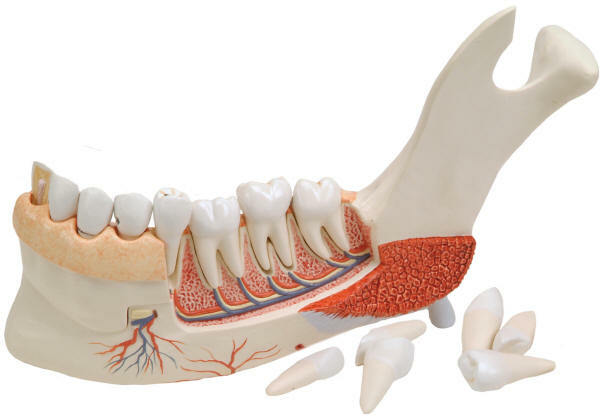 Oversized model of premolars and molars featuring many common dental problems, some of which are: abscess, advanced periodontitis, cavity, crown, decay, filling, gingivitis, plaque, and severe bone loss. Comes with base and patient education card. This twice life-size model shows an adult lower jaw. One half of the model shows eight healthy teeth and healthy gums. 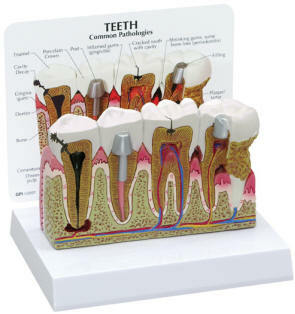 The other half shows the following dental diseases: (1) Dental plaque, (2) Dental calculus (tartar), (3) Periodontitis, (4) Inflammation of the root and (5) Fissure, approximal and smooth surface caries. 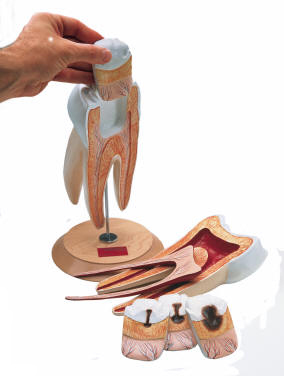 One part of the front bone section can be removed from the dental disease model to view the roots, vessels and nerves. Two molars are sectioned along the length to show the inside of the tooth. Comes with base. This giant molar model is 15 times life size. It divided into six parts. It depicts an upper triple-root molar and separates into 6 parts. The molar features a longitudinal section through the crown, two roots and the pulp cavity. 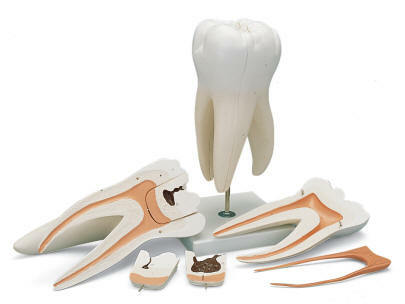 The giant molar contains removable pulp and three tooth inserts with different stages of advanced cavities. Comes with stand. It portrays a molar from the upper jaw. Divide the molar longitudinally to expose its interior from crown to root. Next remove the pulp from one half of the tooth. Then extract a section of the crown, from the other half. Finally insert any of three additional interchangeable sections exhibiting advancing stages of caries. Principal structures, hand numbered on the model are identified in the accompanying key. This three times life-size model of the human jaw has eight diseased teeth. They show various stages of caries from a small and easy-to-treat example on an incisor through advanced degradation of molar, showing exposed root. The front section of bone and all the teeth are removable from the half lower jaw, one incisor is longitudinally sectioned. Nerves, blood vessels, the sublingual and submandibular glands are shown. These diseased teeth in this dental model show various stages of cavities from a small and easy-to-treat example on an incisor, through to advanced degradation of a molar, showing exposed root. 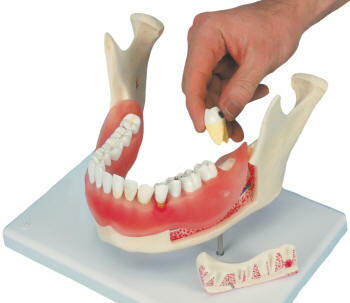 Using this half lower jaw model it is simple to explain the necessity for good tooth care and demonstrate dental anatomy.